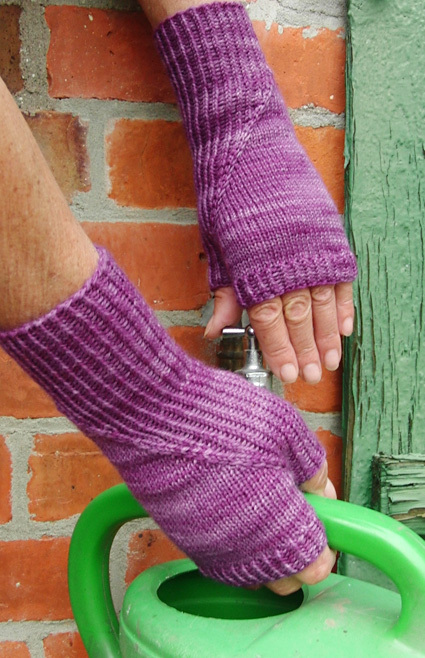 A perfect accessory to wear on a chilly day is fingerless mitts. 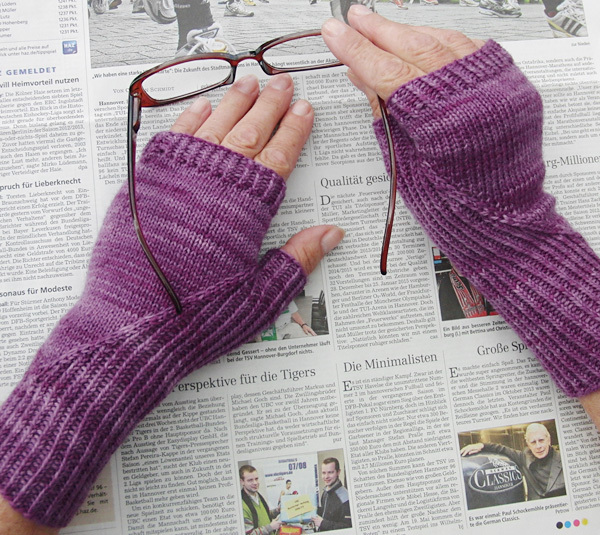 They do a wonderful job of keeping your wrists and hands comfy and cozy and at the same time your fingers are free for all the tasks that need to be done: texting, typing, knitting, handling money, you get the idea. But not only do they keep your hands warm, they are also fashionable and add a little highlight to your wardrobe. I designed these as a basic that goes with different outfits and the simple yet elegant design is suitable for women and men alike. The special attribute is the unusual placement of the thumb gusset, which is worked not even near the thumb. 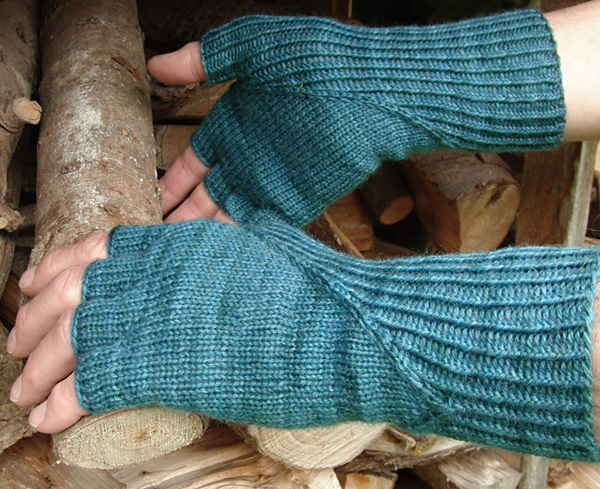 The mitts look a bit skew when off the hands, but fit your hands comfortably snug when worn. 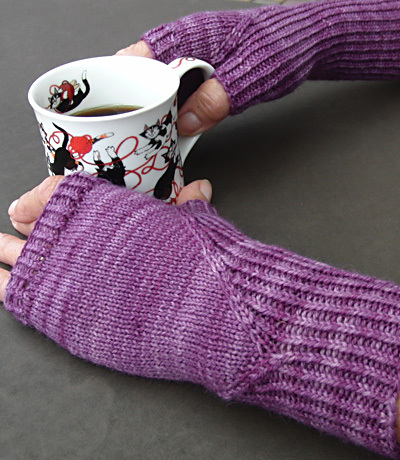 The mitts are rather long to stay nicely under your coat sleeves to keep out the chill. 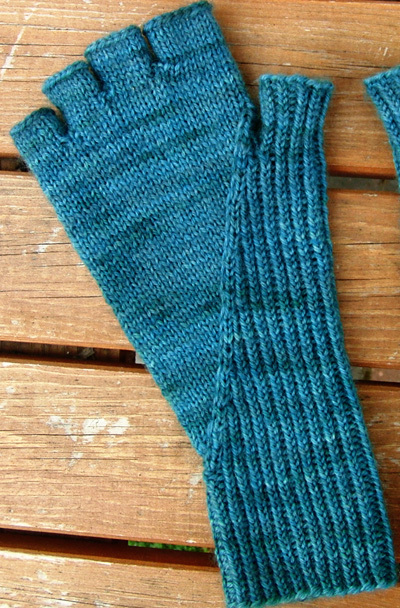 There are two versions to choose from: easy-knit Fingerless mitts (shown at left), and a little-more-challenging-but-totally-worth-it fingerless gloves (shown below). Note: Choose the size closest to your hand circumference. Note on sizing: The number of stitches determines not only the width but also the length if the pattern is knit as written. If you wish to make your mitts wider but avoid an increase in length work fewer cuff rounds before beginning the "travelling pattern". Note: For either style, the design uses approximately 180[210, 240] yards. The mitts and gloves are worked the same way until you hit the upper hand. This design is "un-handed", in that the left and right are the same. 1/1/1 LC: Slip next 2 stitches to cable needle and hold in front of work, k1 tbl, slip last stitch from cable needle to left needle, k1, k1 tbl from cable needle. RLI (Right Lifted Increase): Insert the right needle into the stitch below the next stitch on the left needle. Pick up this stitch and place it on the left needle, then knit into it. 1 stitch has been increased. Note that as you work the "travelling pattern", some rounds will have the rib start with a purl stitch, some with k1 tbl. Always work the stitches as they lie. CO 50[58, 68] sts. Distribute sts across needles as you prefer and join to work in the round, being careful not to twist. Work 20[15, 10] rounds in Rib Pattern. Round 1: 1/1/1 LC, place marker after the first stitch of the cable for start of round. Work in Rib Pattern as set to end of round. Round 2: K1, work in Rib pattern as set to end of round. Round 4: K2, work in Rib pattern to last stitch, k1. Round 5: K to marker, LLI, slip marker, ssk, work in Rib pattern to two stitches before next marker, k2tog, slip marker, RLI, k to end of round. Round 6: K to marker, work in Rib pattern to next marker, k to end. Repeat Rounds 5 & 6 4[6, 8] more times. Round 7: K to marker, LLI, slip marker, ssk, work in Rib pattern to two stitches before next marker, k2tog, slip marker, RLI, k to end of round. Round 8: K to marker, work in Rib pattern to next marker, k to end. Round 9: K to marker, LLI, slip marker, work in Rib pattern to next marker, slip marker, RLI, k to end of round. 2 sts increased. Round 10: K to marker, work in Rib pattern to next marker, k to end. Next round, divide for thumb: K to marker, LLI, slip marker, ssk, work 2[2, 3] sts in Rib pattern, place next 17[19, 21] stitches on waste yarn or stitch holder, cast on 3 stitches using backward loop method, work in Rib pattern to next marker, k2tog, slip marker, RLI, k to end of round. 52[60, 70] stitches total, 9[9, 11] stitches between markers. Round 1: K to marker, work in Rib pattern to next marker, k to end. Round 2: K to marker, LLI, slip marker, ssk, work in Rib pattern to two stitches before next marker, k2tog, slip marker, RLI, k to end of round. Round 3: K to marker, work in Rib pattern to next marker, k to end. Repeat Rounds 2-3 2[2, 3] more times until there are only 3 sts left between the markers. Next round: K to marker and remove, sl1, k2tog, psso, remove marker, k to end of round. 50[58, 68] stitches. Work even in stockinette until the mitt reaches the base of your pinky, approximately 6 rounds. Top edge round: Work Rib pattern around. Work 6 rounds of Rib pattern as set, or to desired length. Setup round: K6[7, 8], put next 38[44, 52] stitches on hold, CO 3 using backwards loop, k the last 6[7, 8], pm for beginning of round. 15[17, 19] stitches. Knit 5[6, 7] rounds or to desired length. Return held sts to needles. Rejoin yarn next to base of pinky. K38[44, 52], pick up and knit 3 sts from the base of the pinky. 41[47, 55] stitches. K6[7, 8], put next 27[31, 36] stitches on hold, CO 4[4, 3] using backwards loop, k the last 8[9,11] sts. 18[20,22] stitches. Knit 6[7, 8] rounds or to desired length. Return held sts to needles and rejoin yarn at the start. K5[6, 8], put next 16[18, 20] stitches on hold, CO 3 using backwards loop, k the last 6[7, 8] sts and pick up and knit 4[4, 3] sts from base of ring finger. 18[20, 22] sts. Knit 7[8, 9] rounds or to desired length. Bind off loosely. Knit 16[18, 20] and pick up and knit 3 stitches from base of middle finger. 19[21, 23] sts. Return 17[19, 21] thumb stitches from holder on needle. Distribute sts across needles as you prefer, and with RS facing, rejoin yarn. Round 1: Work 17[19, 21] sts in Rib pattern and pick up and knit 3 stitches from CO sts of the hand. 20[22, 24] stitches. Work 10[11, 12] rounds in Rib pattern or to desired length. Bind off loosely in pattern. Block and weave in all ends. The ends can be used to close up any holes that may have formed between fingers, and where you picked up the additional stitches for the thumb. Mone lives in a small village in Northern Germany and loves to craft and be creative. 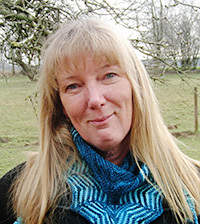 You often find her sewing, taking pictures or gardening and most often knitting and working on new pattern ideas. She has a special fancy for accessories and loves to give basic patterns a new twist with a different construction.